(BPT) - Nearly one-third of adults have high LDL-cholesterol levels, which is also known as bad cholesterol, a key risk factor for heart disease, according to the Centers for Disease Control and Prevention. And, unfortunately, about 70 percent of adults with high LDL-cholesterol don’t have the condition under control. For the many people working to manage their cholesterol levels with the help of their diet, including corn oil may provide important heart-health benefits. Recent research in the Journal of Clinical Lipidology shows that a diet with corn oil, like Mazola, helps lower LDL-cholesterol and total cholesterol more than extra virgin olive oil. Additionally, corn oil has four times more cholesterol-blocking plant sterols than olive oil and 40 percent more than canola oil. Plant sterols are plant-based compounds naturally present in fruits, vegetables, nuts, seeds, cereals, legumes and vegetable oils. When consumed as part of a diet low in saturated fat and cholesterol, plant sterols can help reduce the absorption of cholesterol in the gut, which, in turn, can lower LDL-cholesterol. And, when it comes to heart health, the type of fat in the diet matters. In fact, in the newly released 2015-2020 Dietary Guidelines for Americans, the emphasis is no longer on eating a low-fat diet but instead choosing quality fats. This includes replacing saturated fats that are known to contribute to heart disease with unsaturated fats, including polyunsaturated fats, like those in Mazola Corn Oil. Corn oil has more than five times the amount of polyunsaturated fats compared to olive oil. Replacing saturated fat with heart-healthy polyunsaturated fats can reduce the risk of heart disease. What’s more, corn oil’s neutral taste complements the natural flavors of foods, making it perfect for stir-frying, sautéing, grilling and even baking. Get more delicious recipes at Mazola.com. Cook and drain pasta according to package directions. Set aside. Heat oil in large skillet over medium heat until hot. Add onion; cook and stir until tender, about 3 minutes. Stir in tomatoes, kale, vegetable broth, lime juice, chili powder, garlic salt and crushed red pepper. Cook 7 to 10 minutes, stirring occasionally. 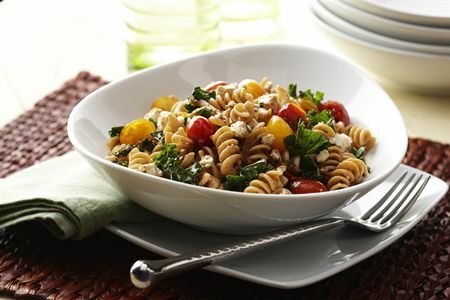 Combine hot pasta, tomato mixture, feta cheese and cilantro in a large serving bowl. Toss lightly and serve. Heat Dutch oven or large pot over medium-high heat and add oil. Add onion, bell and jalapeño peppers and cook for 2 to 3 minutes until vegetables are softened. Add chili powder and cumin and cook for 1 to 2 minutes until spices are aromatic. Add chicken broth, sweet potatoes and garlic. Bring soup to a boil; reduce heat to medium and cover. Cook for 15 minutes. 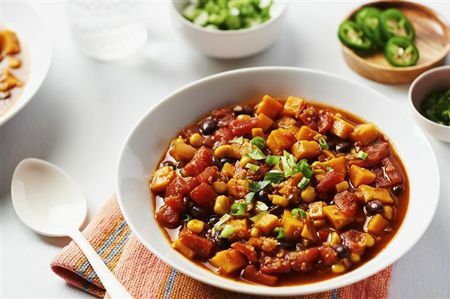 Add tomatoes, quinoa, black beans and corn and cook an additional 15 to 20 minutes until potatoes and quinoa are tender. Serve with fresh green onion, cilantro or jalapeños for garnish.